Stopped for food with the wife's family after finding nothing in Morecambe food wise on a Sunday afternoon. 2 ales on tap which were Thwaites and Wainwrights. 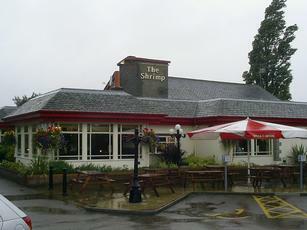 Large and modern, the whole purpose of this place is to serve carvery food to the masses! But to be fair the food was very good as was the service, wasn't my choice to eat here but on this occasion I was proved wrong. Now a Toby Carvery; I thought this would be good for the area as the 'Brewers Fayre'brand has become rather 'tired'.Have been in several times at the weekend;the food is good and drinks reasonably priced,my only 'whinge' is that the staff push you out of the restaurant area once it gets past 10pm, and they can't wait to get the punters out so they can all go home-which on my last visit they would not have been able to do without 'police assistance',as the place was full of 'gyppos'piling up the pints on the tables at 'last orders'.No sign of 'Management'This wouldn't have happened when Stan Donnelly ran the 'Shrimp'. Big Brewers Fayre pub so you know what to expect. Probably the friendliest bar staff we met on our weekend trip.